Constipation can cause significant pain and discomfort to the individual experiencing it and is one of the most common concerns for patients who are receiving palliative care. 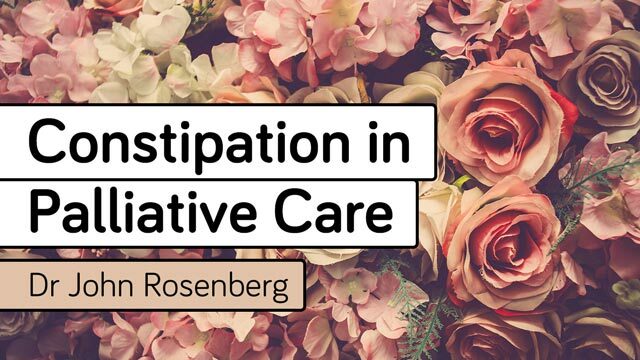 This Course focuses on the assessment and management of constipation in palliative care so as to reduce discomfort and improve quality of life. All healthcare professionals, particularly nurses working in palliative care, aged care, and acute and community care settings. Assist health professionals in the application of best available evidence and expert opinion for the assessment and management of constipation in palliative care. Constipation is a clinically significant cause of distress for people receiving palliative care and family members who care for them. With sound assessment, we can identify a constellation of strategies to address the management of constipation in those receiving palliative care. The need for education in the causes of, approaches to assessment of, and intervention strategies for constipation is required. Dr John Rosenberg is a Registered Nurse with a clinical background in community-based palliative care. He has worked as an educator and researcher in care of people at the end of life. John was responsible for the development of the postgraduate Chronic Disease Management and Palliative Care suite of courses at the University of Queensland School of Nursing and Midwifery. He is a co-author of the Framework of Competency Standards for Specialist Palliative Care Nursing Practice. John is the immediate past President of Palliative Care Nurses Australia Inc., the peak body for nurses in Australia caring for people at the end of life. He was the inaugural Director of the Calvary Centre for Palliative Care Research in Canberra with the Australian Catholic University. John currently works as a Research Fellow in the Centre for Research Excellence in End of Life Care at Queensland University of Technology. Constipation in palliative care is a day to day experience in my place of work.